It is a fact that Washington DC is a kid friendly city. Although the city is known for its government buildings, there are also many other fun places to explore that your kids would definitely love and enjoy. Here are some great places that children of all ages would love. * See the animals in the National Zoo – This place is the friendliest place in Washington for kids. There are over four hundred species of animals that you can find here. This zoo is located in Rock Creek National part which is part of Smithsonian Institution. The entrance fee is free. * Explore the National Museum of Natural History – This is a favorite Smithsonian museum for kids. There are wide variety of artifacts like dinosaur skeleton, white shark and hope diamond. There is also a hands-on display in the Discovery Room where children can touch crocodile’s skin and play dress up. * Be awestruck at the National Air & Space Museum – This has the largest collection of air and space craft. There are IMAX films and shows that you can watch throughout the day. Children can be awestruck at some life size displays. * Discovering the Discovery Theater – If you have school aged children, Discovery Theater is perfect place for them. It is located in Ripley Center on the National Mall. There are classic stories and folktales being told through puppet shows, dance, musical and mimes. * Learn more at National Museum of American History – Children can use their imagination to learn about the country’s history. There is a hands-on science and invention center. * Have fun at the Bureau of Engraving & Printing – This is where children can see how US paper currency is being printed, cut, stacked and examined. 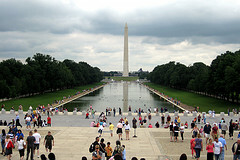 * Catch a glimpse of Washington Monument – This is where the children can see the city in a bird’s eye view. * Walk at Wolf Trap Farm Park – There are performances being held in this park from music, dance, storytelling, theater and more. * Experience the Glen Echo Park – This place offers different activities from dance, theater and arts for both children and adults. There are concerts, demo workshops, and festivals being held every month. You can also enjoy Dentzel carousel and Adventure Theater. * Scream at Six Flags America – It is a 30-minute drive from downtown Washington. It is theme packed with hundred rides, shows and largest winter park. It only opens between the months of April to October. Copyright © Travel to Washington. All Rights Reserved.